Vincent Price and Lon Chaney Jr. star in another solid AIP Gothic from Roger Corman, inspired by H.P. Lovecraft. MGM US R1 DVD. And laugh --but smile no more." After the comedy of The Raven (1963), his sixth AIP Gothic saw Roger Corman returning to the more serious style horror of his first entry House of Usher (1960). 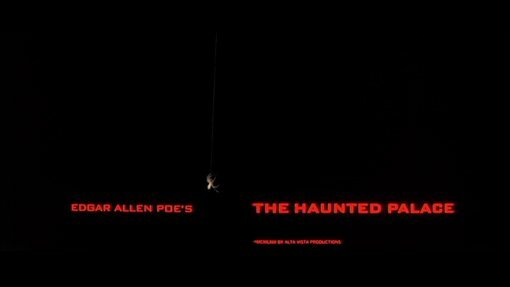 Aiming to keep the series fresh, Corman chose not to make another Poe film but instead shoots a script adapted by Charles Beaumont from the works of cult writer H.P. Lovecraft (creator of the Cthulu mythos), however, the AIP producers wanted to promote it as another Poe film and thus some very tenuous links to The Haunted Palace poem from Poe's story Fall of the House of Usher were incorportated (hence the opening and closing texts and the curious reference to the castle as a Palace throughout the film). The script itself is well written with some good dialogue and although the references to Lovecraftian mythos are rather brief, there are some effectively creepy and tense moments. The climax is particularly strong thanks to some solid characterisation throughout. Working again with series regular Floyd Crosby, Corman directs the film very well, showing a lot more skill than he is ever given credit for, with some very nice sweeping camera work, boosted by some very good gothic sets and well used matte paintings (fans of the series will recognise some stock shots). Corman regular Ronald Stein provides an effective orchestral soundtrack that helps the film along. Vincent Price of course takes the lead role and gives a superb performance in effectively a dual role both as the mild-mannered Ward and in his possessed form as the evil Curwen. The attractive Debra Paget is second billed as Ward's wife in a well written role (certainly she does more than just scream) and performs well. Many of the AIP Gothics boasted an old Universal Horror star in the cast and Haunted Palace gets the original Wolf Man, Lon Chaney Jr. as Curwen's sinister assistant. Although not getting much to do, Chaney looks good here and it is a long way from his final shuffling performance for Al Adamson (Dracula vs. Frankenstein (1971)). The rest of the cast are effective in their roles. A return to the serious gothic horror that kicked off the AIP Gothic series, Haunted Palace is a solid film but ultimately it has nothing new to offer to the franchise. Certainly recommended to fans of the series who don't mind a retread of the earlier themes. Lon Chaney Jr. - the star of many 1940s Universal horrors, best remembered as the Wolf Man Larry Talbot. Directed by anyone interesting? Roger Corman - most famous for producing hundreds of low budget horror and sci-fi films, he had a 15 year career as a director including First World War movie Von Richthofen and Brown (1971) . Is it scary? A couple of jump shocks and some good tension. Who is it for? Partly recommended to AIP Gothic fan - certainly of interest to Price and Chaney fans. The print quality is generally very strong with only mild grain and no print damage. (Some stock shots used in a few scenes have slightly lower quality). Interview with Roger Corman about the origins of the film, and the Lovecraft/Poe debate. Interesting. (10 minutes). Availability Available in a double-bill pack with the Tower of London (1962) DVD on a dual-sided disc. Part of the MGM Midnight Movies series. Other regions? Available in Germany from E-M-S as Die Folterkammer des Hexenjägers with English and German audio. Effectively written, directed and acted, Haunted Palace is solid, just a little too similar to the previous entries. Partly recommended. A good print with trailer and an interesting interview piece. All text in this review written by Timothy Young - 20th January 2007.